Nixon Motor Sports: Why You Should Worry About Going Bald! Going bald or tired of shaving your head? That's none of my concern, but on the other hand I AM worried about your bald tires! One of our main concerns at Nixon Motor Sports is safety, and considering how dangerous a 3,000 pound car can be at highway speeds we think that having safe tires is very important. 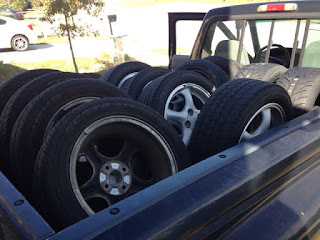 I was just glancing over some information from the Rubber Manufacturer's Association, and besides learning about the latest transportation bill in the US, recent developments on the debate of having a spare tire or not in new cars and other interesting auto related topics, the subject of bald tires caught my attention. A recent survey of several thousand cars out on the street found that nearly 12% of them had bald tires Rubber News Link. I'll assume that the survey is accurate, so holy smokes people, what are you thinking? More than one in ten drivers could easily have a very bad hair day the next time they hit some wet pavement, ice or snow, or just try to stop quickly to avoid a road hazard (like me)! Sure, I'll grant you that most people probably do not enjoy tire shopping, and I myself really don't like that super over powering aroma at the local tire store (Eau de Rubber), so it could be that part of the issue is that people just don't have much incentive to spend money when their car is driving just fine. Also, tires are not the cheapest thing in the world, and with gas prices falling it makes spending any other money on the car stick out a little more, as in "hey, I just filled my tank for less than 20 bucks and they want me to pay $600 for four lousy tires"! Where am I going with all this gibber jabber about tires? Well, let's stick with safety, and the fact that having tires that keep you safe are cheap compared to the cost of NOT having safe tires. Shoot, I can feel an entire series of blog posts coming on about all the different things to know about tires, such as size, wear ratings, speed ratings, the DOT code that tells you how old a tire is, the different sizes of tires, the difference between summer and high performance tires, where to buy tires, how to shop for tires, what's the best autocross tires, etc. Oh yeah, here comes a whole bunch of tire info. For now, check your tires and replace them if they are worn. You can even ask Santa to make it a Christmas present!